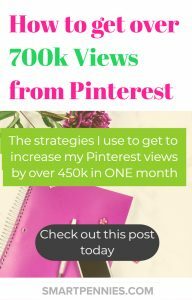 The Exact Strategy I used to go from 260k monthly views on Pinterest to over 600k monthly views in ONE month. Are you stuck with your Pinterest Strategy? 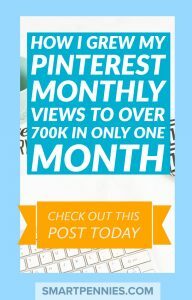 How about finding out the exact Strategy I used to go from 260k monthly views on Pinterest to over 600k monthly views in one month. Have a look at my current Pinterest Analytics below. 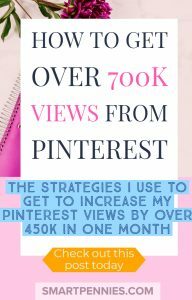 This is my exact strategy that I used to go from 260k monthly views on Pinterest to over 600k monthly views in ONE month yes ONE month. Are you wanting to extend your reach in Pinterest? If you are check out this post! So it all began one fateful morning looking at my Pinterest Analytics and …. Why oh Why can’t it just stay on an even keel? But that is the Pinterest rollercoaster! Before I go any further – now the Bad news guys! 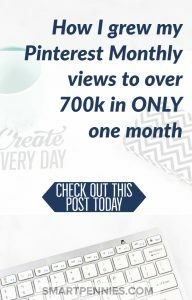 Just because you can win at Pinterest doesn’t mean you will win at increasing your blog traffic! It can help with traffic to your site but you have to make sure you have clickthroughs! Yes you heard it CLICKTHROUGHS! There are two resources out there that I have incorporated into my strategy to have such exponential gains. Both of them are not highly expensive blogging courses and they each have advantageous and disadvantageous which I will touch on later. Having followers that are engaged with YOU! Because as Pinterest has said they will judge the quality of your pins first by how engaged your followers are with them before they move them out as ideas for others to view. Making sure you are Optimising for Pinterest, after all, it is a search engine so you should treat poor old Pinterest like one and include Keywords in your Pinterest description just like you would do for Google. Make sure that when you get click throughs that your content is great not just good it needs to be GREAT. Of course they are trying to sell their Promoted Pins campaign. I suggest a course if you have NO idea like Redefining moms Promoted Pins – I haven’t done this course yet but I may do at some stage because as you know I am a bit of a course junkie! Pinterest also have a handy PDF download on great pin designs. What does it mean to have followers that engage with you? Basically that they will love your pins and follow you and then click on those Pins back to your Website. Your account has to say Wow! Should you bother with Board covers for your boards? Honestly, I am not sure – Your followers will see them but will it make them want to follow you? Did I follow folks with great board covers not really it was more what kinds of boards they had on their account more than anything else. In this scenario I will follow the account if the top part of the account looks great and if the board I have been looking at is curated with great looking pins. I think might looks great, don’t you? So what am I trying to say ultimately I don’t think board covers mean much anymore look at my new boards see any board covers no! Has it affected my account NO! Save your time to optimize your board with KEYWORDS on the title and descriptions making it read great and not keyword stuffed! Boards should be narrowly targeted boards- again check out my account see how many new boards I have on there and what topics I have covered. I will tend to favour boards over sections on one board I feel it gives you more ‘ juice ‘ in Pinterest. See some of the titles to my boards below. So they appear FIRST in your follower’s smart feed and make sure you don’t pin the same pin time and again – the point of Pinterest is to give followers fresh new content every day. Its FREE to try guys take a look. I love it so much I pay for using it. So what else have I done- I have changed my Pinterest Image sizes. Your pin size 2:3 is the best ratio eveyone has different opinions on the exact size so anything from 600 to 735 width and 900 to 1250 is optimal otherwise Pinterest will cut you off allegedly – put as I have been using my pinning strategy I have noticed extra long pins even on my mobile NOT cut off so go figure! If you are anything like me I definitely notice LONG pins! I haven’t as yet tackled the Really long pins challenge but with this post, I am going to trial 2 extra long pins 735 width by 1500 long so I will let you know! 3. Pinterest SEO use it! What does this mean? Pinterest, as I said above, is like Google it’s a search engine so you need to treat it like one, you need to add in keywords to your Pin title AND description. Look at the image above I popped blog traffic into the search traffic. 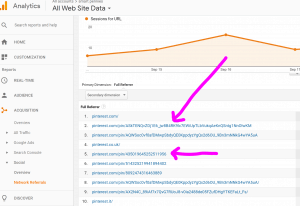 The tiles above are keywords that Pinterest has pulled out use them in your Pin descriptions if relevant this will help your SEO. Don’t forget to look at the best pins on the top left using SEO. Can you use something similar for your title- do not copy! Make sure its engaging try this resource its a great snapshot to help you out from twelveskip. Also, make sure you also use Google Search Engine optimization keyword your title too! I use the FREE version of Kwfinder to find great keywords add them to the search and see what the percentage chance of ranking for it is. Ok, so I don’t know if this has made any difference or I should go back and check the Pins I used paid stock photos on! So I can say for sure but with all my plans I just don’t have time other bloggers swear that using paid stock photos do make a difference in getting clickthroughs – all I can say is try it and see if it works for you. But I did buy a few stock photos and have used them on my Pins I also still use free photos. There are lots of debates about the best colours for your pins. Most of them center around using reds/ pinks for your pin colours and avoiding dark colours. What I would say is as long as your pin descriptions can be read over images then test out the designs using different colour combo’s. I have seen some really great pins that are not pinks or reds. Most people feel that warm colors – reds, pinks, and purples do better than cold colours blues, greens, yellows. Avoid adding text directly over images unless they are muted down significantly ( or add an overlay which is what I tend to do over the image ) this will ensure your text is seen. I have seen some bad images and I don’t want to single any out particularly either so just make sure your pins are legible on desktop and mobile. You would be surprised when you look at your account on mobile. All I would say is test and test keeping things the same over two pins and only changing one thing at a time and seeing if it makes a difference. Yep, its a pain in the behind because let’s face it do you really have time for it! And honestly, do I do this – not very well! When I started this challenge I decided to make Pins that were very bright and the words were very clearly read. 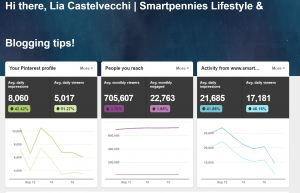 How to test – look at your pin stats are they gaining more clicks back to your site compared to saves? If they are you are on to a winner and start doing more of that! – look at your google analytics for this one. Long pins are still seen on Pinterest so use them! Make at least 3 Pins for each of your posts to test different designs and hid your pins using this nifty bit of code. Add multiple pin images to your blog posts ( different ones of course) and hide them using this code. You will have to switch to text editor to add in the code above to your images highlighted in bold and once you switch back you should see the image disappear. So guys fancy putting this to the test? How about you design two new pins for your new or old post – make them compete against each other and let me know how they are doing! Post it on the comments if you like with a link to the Pins that are taking off! 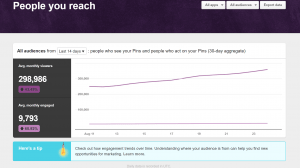 Go to Acquisition > All traffic > Referrals > Pinterest to view your top pinned posts. This isn’t my most favourite way to circulate my best Pins it’s clunky and time-consuming! So I take the easy option and use Tailwindapp’s Pin Inspector it’s free to try out. 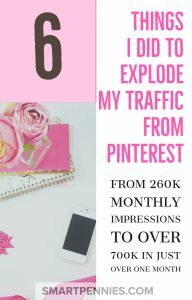 Pinteresting Strategies Ebook suggests you pin from using the URL from Google to move your pins around see the arrows below for the pin addresses. Using Acquisition > All traffic > Referrals > Pinterest to find your top pins. And the strategies in my 5 tailwindapp strategies using pin Inspector specifically the Breakingtheonepercent Jeff and Ben use Pin inspector to move their best pins around. Incidentally, with Looping coming out for Tailwindapp this will make moving your top pins around even easier. Make sure you regularly check your Google Analytics to see which posts are sending you traffic from Pinterest and look at the clicks on the Pins for these posts can they be better optimized to further increase your clickthroughs? 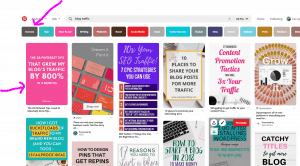 Look at content that isn’t doing as well is it your Pin design follow the tips above to redesign some new pins for your post and see if you can increase your clickthroughs – new pins equal new content in Pinterest’s eyes even if its an old blog post. Look at which pins are doing particularly well add them to a secret board so you can see at a glance what you should aim for when you are making new pins. Of course, you want to make sure that your content is also great too! Add pins to facebook share exchanges- just to be clear I HARDLY every participate in facebook occasionally I will add a comment but it’s not very often, to be honest, it’s not my favorite social media channel. I just can’t muster the enthusiasm for Facebook as a channel I personally hardly ever use it as it is and only to connect with friends who don’t get a mobile sign but can access free wifi to keep in touch with them. Ye,s there are places in Scotland one of my favourites called Crinan ( in Argyllshire) that only has landline phone connections with no mobile signal- it’s very refreshing to visit! 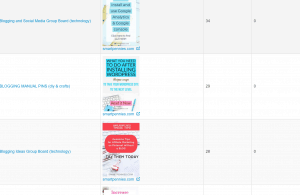 One of my few criticisms on Pinteresting Strategies Ebook is the fact that you have to use Google Analytics to figure out your best pins and 2- have a spreadsheet for every group board to be able to see when you last pinned to it! Phew, lot of work and I found that figuring out the best way to do it way too complicated. I pin only to my best group boards using Tailwindapp group board analytics to figure this out but I pin to ALL yes ALL my group boards manually – YEP don’t get shocked has it hurt my account that would be a big FAT NO! I have no idea why not specifically just that it hasn’t. Basically, I don’t have time to fanny about pinning to tribes and pinning from tribes especially when I am manually pinning anyway! Yep, another one blown out the water! I schedule between 50-55 pins per day using Tailwindapp and also manually pin so we are getting on for a lot of pins guys has it affected things again a big FAT NO! Pinned lots of others content- well that would be a NO! 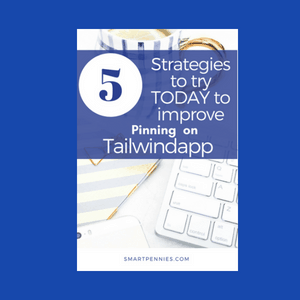 I will periodically once a month go into my group boards and pull out a few pins to schedule via Tailwindapp. And when I manually pin I will repin for every ONE pin I add or as the group board rules. I try and avoid Group boards that have reciprocal repins requirements when I am Tailwindapp scheduling. Ok, so how did I actually do it? So, my strategy has revolved around actually spending time on Pinterest! Why I think it worked for me is anyone’s guess I don’t want to say it was only one thing I did but who really knows Pinterest. Kyla’s Manual Pinning Simplified Ebook if you want to find out about her ebook you can buy it by following this link it is just one part of my overall strategy that has helped me increase my Monthly Pinterest Impressions ( as I am writing this its now well over 700k) You never know maybe by the time I publish this it will be over 1 million ha ha here’s hoping guys! Carly’s Pinteresting Strategies although as I have said I simply couldn’t find the time or had the inclination to use her overall strategy to manual pinning. BUT she does have lots of great information in her Ebook about Pin designing, board designs and how to keyword search and this is just a taster of what you will find out about. So once I read Manual Pinning Simplified it was like a revelation on how to manually pin simply without lots of complicated scheduling and notebooks and spreadsheets. 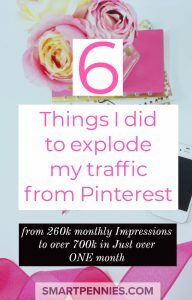 After I went through both these Ebook’s I finally figured out a bit more about Pinterest and what it wants with my manual pinning strategy. I would recommend both these resources especially if you want to go in-depth then Pinteresting Strategies is the Ebook to go with but if you are looking for something simple but are happy your account is set up the way it should be then I would recommend Manual pinning simplified. It is a very simple straightforward Ebook so in some respects its the other end of the spectrum from Pinteresting Strategies. I use a combination of both these strategies for each book to manually pin and I also schedule using Tailwindapp. I make up 10 pins as I have said before and reserve two purely for manual pinning – I am going to split this to 3 or 4 for manual pinning and 6 or 7 for scheduled. You don’t have to make so many pins as I have said I love the designing part of making up my Pins. Pin your new pin to your most relevant board FIRST guys Pinterest tells you this I can’t tell you enough BUT do it – don’t have a relevant board then CREATE ONE. For instance ,I wouldn’t pin my Christmas DIY crafts pin to my Crafts board NO I pin it to my Chrtistmas craft board. Ultimately if this is all crap you can get in touch! 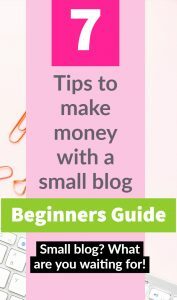 What this isn’t is a GUARANTEE it will work for you most other bloggers will tell you great try it it’s fab but really I can’t tell you if this will definitely work for you-you need to try it for yourself. Basically, this is what I have done in the last month and it been one of the only changes I have made so go FIGURE guys! BEFORE this not after the 14th August which was when I started manually pinning, I wrote the above post in July time which coincided with Boardbooster going belly up. I was also making tonnes of pins per post before this date as well using Adobe spark. Hi, love your no fluff approach and honest opinions on the ebooks. Great read, thanks. Glad you enjoyed the post I try as much as possible not to have fluff in my posts!